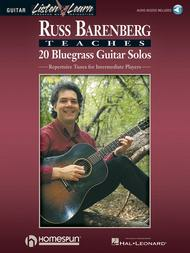 One of America's top bluegrass guitarists teaches a variety of flatpicking solos for twenty favorite songs and instrumentals. Played slowed-down and up-to-speed for learning players, with rhythm tracks availble for download or streaming online for great practice sessions. Songs: 'Liberty,' 'Soldier's Joy,' 'Forked Deer,' 'Eighth of January,' 'Hot Corn, Cold Corn,' 'Down Yonder,' 'John Henry,' 'Blackberry Blossom,' 'Leather Britches' and more. Level 3. April 25, 2003 Great solo instruction! 31 of 65 people found this review helpful.